UPDATE (January 26, 10 a.m.): Police told Inquirer.net that there are now five fatalities following the bus explosion on EDSA yesterday. Chief Superintendent Jose Arne Delos Santos said Irish Teniola, 22, succumbed to head injuries at the Ospital ng Makati today. 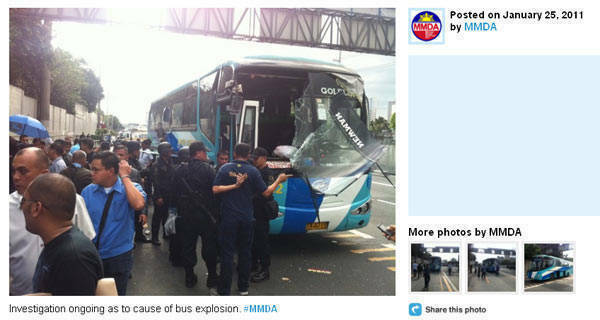 According to Inquirer.net, the four other passengers who died from the blast are Shirley Khristel Hausena Andes, Johansson De Leon Reyes, Mariano Magayaw Salustiano and an unidentified man. The 14 injured people are being treated at the Makati Medical Center (Mary Grace Buen Borondia), Ospital ng Makati (Anabel Gozon, Antonio Lino and Jeffrey Victoriano), and St. Luke’s Medical Center (Roy Rivera, Fe An Sy, Fleur An Sy, Aiza Hutalle Peralta, Virgilio Aquino Reyes, Paul Richard Reyes, Jennifer Valdez Andoque, Veronica Sanchez Gando and Gloria Aquino Reyes). An improvised explosive device triggered by a cellphone caused the explosion near the Buendia MRT station, presidential security adviser Cesar Garcia said, according to the AFP. "The fact that this has been established-that the device used was an improvised explosive device similar to the ones used by terrorist organizations in the southern Philippines-raises the possibility it was a terrorist attack." (Published January 25, 3 p.m.) Two people died and at least 17 were hurt when a bus exploded on the northbound lane of EDSA near the Buendia MRT station today, reports Inquirer.net. The cause of the blast is still unknown as of posting time. A bomb squad has been sent to the area where the Newman Gold Liner bus (plate number TXJ-710) exploded. The MMDA Tweeted that the northbound lane from Ayala to Buendia has been closed off. Motorists are advised to take alternate routes.